For its 7th year, Google Developers Group Cebu (GDG Cebu) is bringing its annual Cebu event, to Dumaguete, Bohol, and Leyte. Now a Visayas roadshow, I/O Extended will kick off in Cebu this July 21 at the University of San Carlos Talamban Campus. The Dumaguete leg will follow on July 28 at the Siliman University while the Leyte leg will happen on August 4 at the Philippine Science High School respectively. This year, I/O Extended is focused on giving attendees a quality learning experience and helping them meet and network with fellow tech enthusiasts and developers. 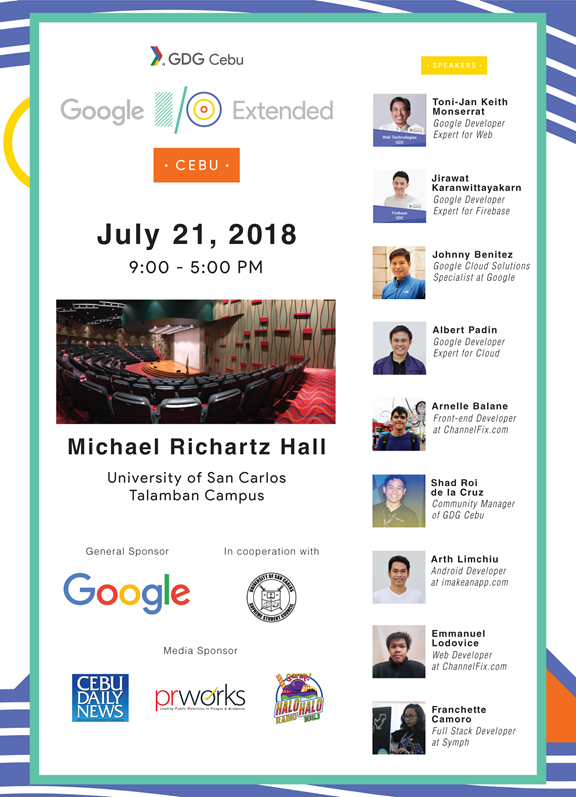 Google Developer Experts in South East Asia and top developers in Cebu will be sharing their insights, knowledge and skills. Topics include the latest in Google Technology specifically on Actions on Google, Firebase, Machine Learning, Web Design and Development, and Android. The I/O Extended Visayas Roadshow is sponsored by Google. The official venue partners are the University of San Carlos Talamban in cooperation with the USC Supreme Student Council, Siliman University Dumaguete, and Philippine Science High School Tacloban. The official media partners are Cebu Daily News and Halo-Halo Radio, and PR Partner, PR Works. Tickets are limited. To register and to secure a seat, visit https://ioxcebu18.gdgcebu.org. For more information about I/O Extended Visayas 2018 and GDG Cebu, follow them on Facebook @gdgcebuorg and join their Meetup group @GDGCebu. The vision of Digital Bohol to have internet connectivity across the province is now closer to reality. This week, Gov. Edgar Chatto received PLDT Visayas Head Rito Ray Salas and PLDT Area Head Isabelo Rosales at the People’s Mansoion. They updated the governor about ongoing PLDT Fiber To The Home, the most optimum connectivity solution. Rosales said PLDT targets a minimum of 1 kilometer of fiber optic connection completed every day. This will allow fiber connectivity for the towns of Clarin, Tubigon, Calape, Loon, Maribojoc, Antequera, Balilihan, Sikatuna, Cortes, Jagna, Garcia Hernandez, Valencia, Dimiao, Lila, Loboc, Loay, and Albur at the end of this year. PLDT also targets connectivity for the remaining towns of Bohol by 2019. Fiber To The Home is the optimum connectivity solution, stated Rosales. The governor welcomed this development as Bohol positions itself in the Information and Communications Technology (ICT) industry. 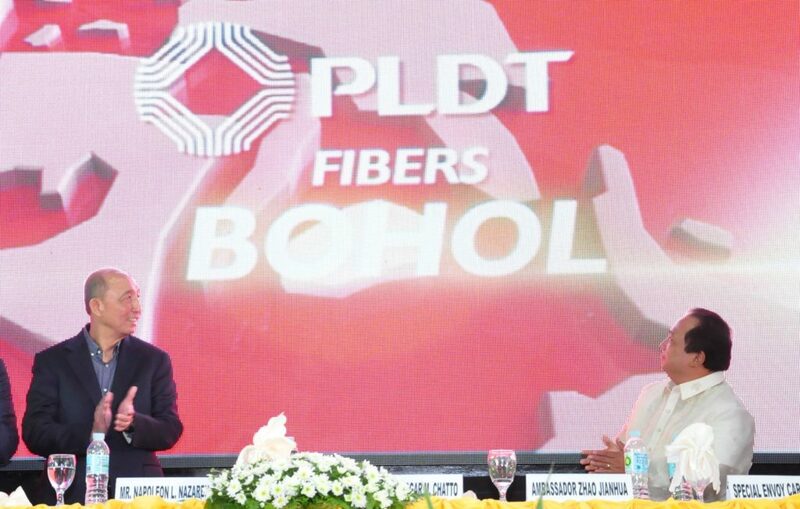 He recalled launching Digital Bohol when PLDT also launched its submarine and inland fiber optic network spanning 328 kilometers – from Cebu through Bohol to Misamis Oriental with PLDT president and CEO Napoleon Nazareno. Digital Bohol is aimed at making every Boholano part of digital technology revolution, and to make technology available. Next to tourism and agriculture, programs have been geared towards creating a niche for the ICT industry. 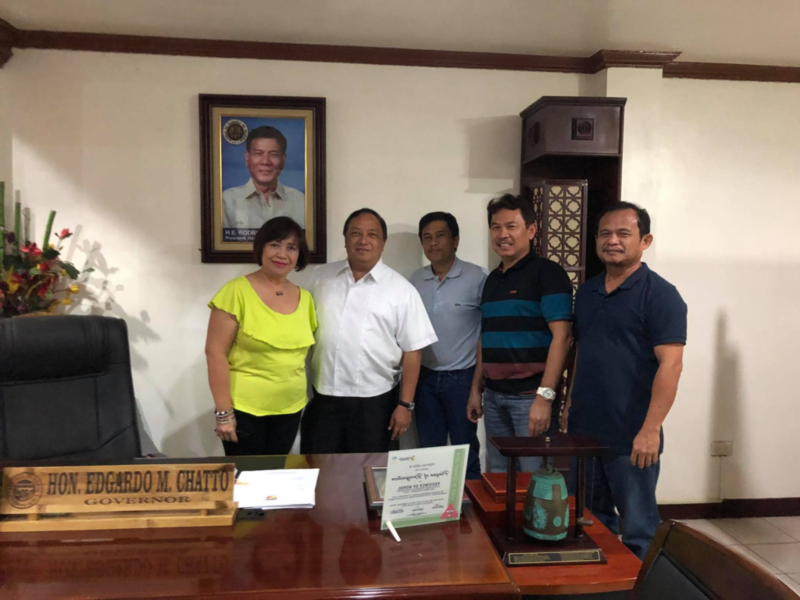 A private sector-led initiative, Digital Bohol key component is the establishment of Technology for Education and Development (Tech4ED) centers in the province where residents can learn about internet, technology, among others. Chatto believes if every citizen is educated on technology, even the rural communities can generate jobs, a faster way to inclusive growth. He emphasized the use of technology for marketing products, linking into the job market, among others. Another initiative to strengthening the third pillar of economic growth is following tracks of tourism and agriculture senior high school specialization with BISU Balilihan as hub. It will take after models of Turo-Turismo of Lourdes National High School in Panglao and Eskwela Agrikultura in San Pascual National Agricultural High School. TAGBILARAN CITY – More than 100 Boholano MSMEs have participated in a digital marketing campaign last June 29, 2018 at Bohol Tropics Resort. Boost Your Business is a project by Bayan Academy and DTI in partnership with Facebook Philippines that aims to promote the use of social media platforms as a tool for creating an advantage in business. The event focused on marketing theories that are applicable on creating good quality content, creative visuals, and effective messages on social media. Mr Carlo Sagun , the event trainor, also introduced the different marketing strategies for Facebook and Instagram-two of the leading platforms in the world. A hands-on application of the theories was conducted afterwards using the apps of Facebook Philippines. Also gracing the one day workshop is the Congressman of the First District of Bohol Hon. Rene Lopez Relampagos as well as DTI Bohol’s very own Jerome John J. Gabin, STIDS who have encouraged the participants to ride on the opportunity of doing business online. According to Mr Sagun, among the chosen venues,Bohol Province has the largest number of participants so far. The Department of Trade and Industry through its Philippine Trade and Investment Center (PTIC) in Silicon Valley advances efforts in promoting the Philippine startup ecosystem development through projects that support the growth of the community. In partnership with the Philippine Consulate General in San Francisco (SF PCG), PTIC Silicon Valley recently launched the Spark447, a co-working space and resource center at the Philippine Center’s building in San Francisco that aims to cater to Filipinos and Fil-Am start-up communities in the Bay Area. Ambassador Jose Miguel Romualdez and Consul General Henry Bensurto Jr. led the soft launch last 22 May 2017. “SPARK447 provide avenues for bringing the community in San Francisco closer together. But it doesn’t stop there, it will bring the Filipino tech community in San Francisco closer to our ecosystems in Manila and make change happen,” said PTIC Silicon Valley Trade Representative May Niña Celynne Layug. Spark447 is a shared office space, networking hub, and a place uniquely designed for rising entrepreneurs, freelancers, digital nomads and internet professionals. It is part of the Philippine Consulate in San Francisco’s “Spark, Connect, Empower” (SCE) movement that aims to gather Filipino and Fil-American communities and individuals in the United States in building collaboration and partnerships that promote nation building. According to DTI Trade and Investments Promotion Group Undersecretary Nora Terrado, the establishment of Spark447 will be instrumental in showcasing the technology and business opportunities in the Philippines. “This will greatly complement our initiatives in promoting opportunities in the Philippines and the talents that we have particularly in advanced industries including manufacturing and the IT-BPM,” said Terrado. DTI in close partnership with the Departments of Science and Technology (DOST) and Information and Communications Technology (DICT) has been supporting and enabling the development of the Philippine startup ecosystem. The collaboration caters from various stages of startup development from ideation to commercialization. According to PTIC-Silicon Valley, several organizations, companies, and individuals, who share in the vision of the SCE movement have pledged their full support of the movement. These include PLDT, Philippine Airlines, The Filipino Channel, National Federation of Filipino American Associations (NaFFAA), One World Institute and Mama Sita’s. According to the recently released 2018 Global Startup Ecosystem Report, the Philippines startup ecosystem has strong foundations in the areas of Fintech, Enterprise Solutions and AI & Machine Learning. In 2017, the DTI led Slingshot ASEAN, a business event developed by the ASEAN Committee on Business and Investment Promotion that gathered startups, venture capitalists and key players in the ASEAN startup community through learning hubs, pitching competitions, plenary sessions, and exhibitions. n photo (L-R seated): Tess Marin, SSS representative; PTIC-Silicon Valley Trade Representative Celynne Layug ; Dir Pura Molintas (DOT-SF); H.E. Ambassador Jose Manuel Romualdez; Consul General Henry S. Bensurto, Jr.; Mrs. Mariz Bensurto, and Deputy Consul General Raquel Solano. Others in photo are Spark, Connect, Empower (SCE) movement partner organizations. Photo from DTI-PTIC Silicon Valley. 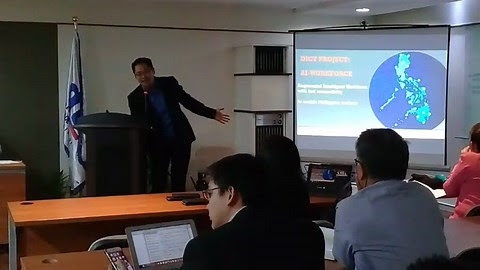 MANILA – The Department of Trade and Industry (DTI) together with the Department of Information and Communications Technology (DICT) and tech pioneer company AI Pros, are set to join forces to train Filipinos in using Augmented Intelligence (AI2) as a solution to the impending threat of artificial intelligence on the jobs in the Information Technology – Business Process Outsourcing (IT-BPO) industry, while encouraging investors and operators to create more Socially Responsible Business Process Outsourcing (SRBPO) in the countryside. “Instead of AI replacing jobs in the IT-BPO industry which is estimated to affect half of the 1.3 million jobs in the sector, the workers will be trained and upskilled to make use of AI2-enabled systems. Basically, it’s making the AI system become the solution to the problem,” Trade and Industry Secretary Ramon Lopez explained. “Augmented Intelligence will combine the power of artificial intelligence with human intelligence to upskill the Filipino workforce and make them more effective and productive by enabling them to do complex and higher-paying tasks. This initiative, summed up under the “Philippine AI Workforce” brand campaign, will provide more jobs to Filipinos and bring the development to rural communities,” DICT Acting Secretary Eliseo Rio added. “We are the first country to launch this kind of initiative. Instead of looking at AI as a threat to the BPO industry, the Duterte administration is using AI2 to provide more opportunities for inclusive growth. We will train and enable our workforce, regardless of their background and experience, to use AI2 to perform smarter and complete difficult tasks, and help them move up the value chain. The training will make them employable, operating even in the rural areas to make this program truly inclusive,” said Sec. Lopez. DTI and DICT will introduce the presence of AI2 solution to the BPO sector in the Philippines (PH). The AI2 solution will employ impact sourcing by involving the masses in the sector’s growth. This will allow 482,000 unskilled workers to handle low-skilled work, while 525,000 low-skilled workers will perform mid-skilled work, and 309,000 mid-skilled workers will be able to do high level tasks. With the help of AI Pros, a technology company founded by Diosdado Banatao and George Yang, industry operators will be assisted in expanding their businesses by designing, developing, and deploying AI2-based services that can be applied to retail, finance, services, and healthcare. Both Dr. Banatao and Dr. Yang are successful Filipino entrepreneurs in Silicon Valley who are committed to help the Filipinos level-up their skills in the age of technology. The Department will then focus on promoting areas with high poverty rates to these companies and provide rural residents with 654,000 jobs. “As we deepen our participation and upgrade along the global value chains of multinational companies, investments in AI activities in various sectors of the economy will be supported,” said Sec. Lopez while highlighting the inclusion of IT-BPM in the top industry priorities to drive the country’s growth and development under the Inclusive Innovation Industrial Strategy (i3S). According to Sec. Rio, the government will focus on rebranding and promoting the new “Philippine AI Workforce” to support the BPO industry and improve the country’s competitiveness. TAGBILARAN CITY, Bohol May 12 (PIA)—Jumpstarting to prop up Bohol’s inventory of trained technical persons who can support to rural communities in their development efforts, the Department of Information and Communication Technology (DICT) in coordination with allied offices, dangle a free technical training to at least upgrade to technical grade skills held by young Boholanos. The DICT is looking for trainees in the Rural Impact Sourcing Technical Training; a 12-day digital marketing and electronic commerce course, running from May 21- and in the Saturdays and Sundays until July 27, this year in Tagbilaran City. The technical training that can provide digital opportunities in the countryside by equipping trainees who have good communication and with basic information technology skills, the edge in digital marketing and electronic commerce, according to Edilberto Aquino Jr., sharing this information during the monthly meeting of information officers in Bohol. 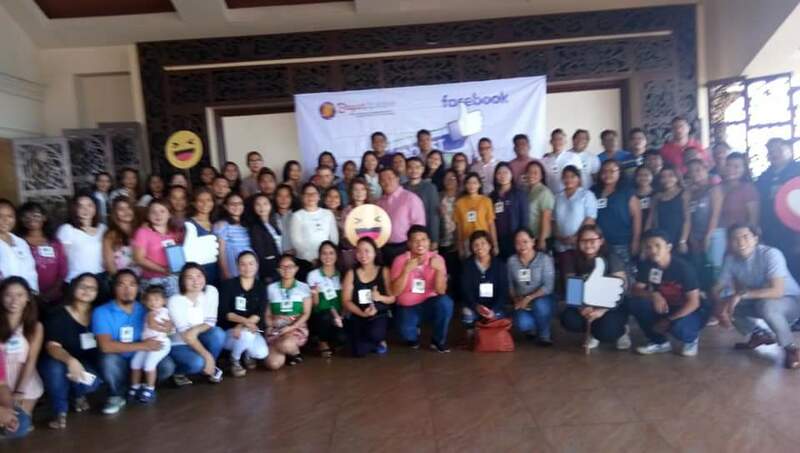 During the same gathering at the Panda Tea Garden Resort, Aquino, who came with another DICT staff said the training includes training modules for branding for companies products and services, web development, product photography content writing, customer relationship management and email follow through. Also included in the technical training modules are data privacy and cybercrime law and digital marketing ethics, search engine optimization and email marketing, social media content creation, social media planning and calendar, business blogging, and building a freelance profile. Applicant however should be Filipino citizens, at least a high school graduate, possesses basic information technology skills and has good communication skills, according to DICT. While the deadline for applications was set May 11, DICT through Aquino said they can still accept applications before May 17 screening examinations. Applications are done online. Interested applicants can apply through http://bit.ly/ristagbilaran as soon as possible, Aquino stressed. The training on Rural Impact Sourcing is also in coordination with the provincial Government of Bohol, City Government of Tagbilaran, Bohol ICT Council, Department of Trade and Industry and digitalph.